This isn’t the first time that I’ve written about the carbon-farmed deliciousness at Stemple Creek Ranch. See my previous post (we’ll call it Carbon-Farmed Beef, Part I) for a nice introduction to the topic, not to mention the wonderful recipe for Thai beef with basil. 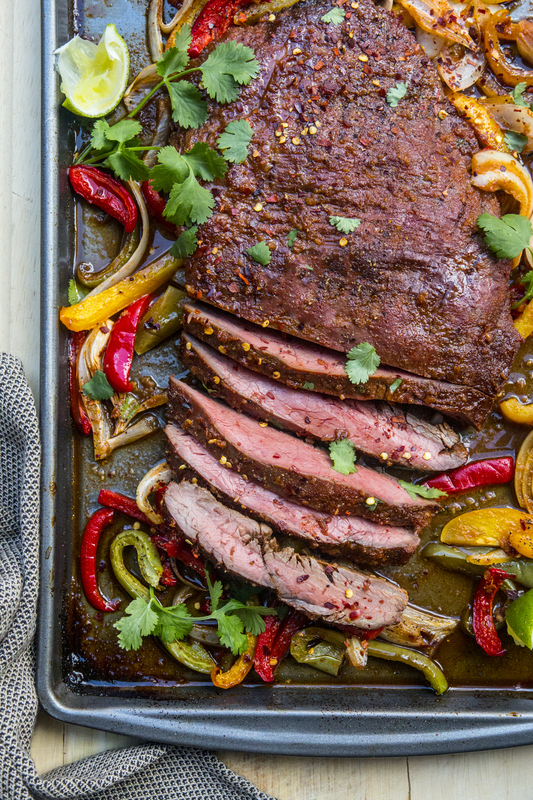  This time, I have created Sheet Pan Fajitas: a one pan meal consisting of marinade stirred together the night before, quiet hours of soaking for the meat, and lastly a quick bake in a hot oven. The result is juicy, fully-flavored beef and rich, sweet vegetables ready to be loaded into tortillas, enjoyed over rice, or simply paired together for a satisfying meal. These Sheet Pan Fajitas are inspired by the regenerative agriculture educational event at Stemple Creek that I participated in last weekend. Co-hosted by Slow Food San Francisco, The Perennial (hi, Anthony and Karen!) and CUESA (hi, Carrie and Brie! ), Stemple Creek welcomed us to their ranch for a day of learning, conversation, grass and soil appreciation, tree-planting, and good food. The day started at Stemple Creek’s event barn (the “party barn”) with a quick introduction to the history of the ranch, and then Loren Poncia—owner/operator of Stemple Creek—introduced us to his cows, and his soil, and his grass. Because carbon farming is really about all three, don’t you know? Carbon farming is a simple concept, yet holds great promise as a model for environmentally sustainable, morally tenable animal protein production. According to Loren, properly-managed pasture is the balance of annual and perennial: tender annual grasses that his herds of livestock keep in check, allowing the tougher perennial grasses to flourish, develop their root systems, and sequester carbon. Sequestering carbon sounds like quite an undertaking, but the beauty of this regenerative agriculture practice is that it uses the harmonies of nature to mitigate the impacts of man-made climate change. The promise of carbon-farming operations like Stemple Creek is to deliver a product that is premium in taste (richly fatty meat from cows finished on carbohydrate-dense hay and the sweetest annual grass), nutritional content (grass-fed means higher in beneficial fats, vitamins, and more likely to be free of antibiotics and hormones), animal welfare (as Loren says, “the cows have one bad day”), and—obviously—eco-friendly cred. So that’s worth celebrating with glorious fajitas, isn’t it? I enjoyed the beef and vegetables over rice tonight, styled with avocado and cilantro. Dinner tonight is a flank steak fajita bowl inspired by @stemplecreek carbon-farmed beef! I attended a regenerative agriculture educational event there last weekend (s/o to @cuesa, @theperennialsf and Slow Food San Francisco for co-hosting) and was blown away by the interplay of soil, grass, and herbivores that can result in carbon sequestration.  Recipe for the fajitas and more discussion of carbon farming coming soon to the blog! Bear in mind that the shape and thickness of the meat will impact cook time, so adjust it accordingly. Also, I prefer my meat cooked medium-rare, so if you want a little more firmness to your steak, then cook it a little longer… you get the idea. Whichever way you cook your steak, I hope you enjoy this recipe and the recap of Stemple Creek’s carbon-capturing on behalf of our health and the planet’s. In a large bowl, combine all the marinade ingredients, and stir well. Add flank steak to the bowl. Marinate for at least 30 minutes, and up to 12 hours. Preheat oven to 400F degrees. Slice the peppers and onion into strips and place them on a sheet pan, arranged so they are in a single layer. Place the flank steak in the center of the pan, and pour the marinade over the top of the vegetables to season them. Wipe away the marinated cilantro and discard. Bake at 400 degrees for 15 minutes. Leaving the pan in the oven, turn the heat up to 450 degrees, and bake another 10 minutes. When done cooking, remove the pan from the oven, sprinkle chili flakes and fresh cilantro over the top and rest for 5 minutes to allow juices to reabsorb. Slice flank steak against the grain to form thin, tender pieces. Assemble fajitas with peppers, onions, and steak. Add avocado, and squeeze some lime over, if desired. Oh my this looks so yummy!!! Oh my goodness… my mouth is seriously watering right now. That looks fabulous! I want to make this soon! This looks amazing! I love all the different toppings too. Fajitas are perfect for any day of the week! Especially the one-pan kind. Fewer dirty dishes ftw! Looks delicious and I learned something new! My mouth is watering at these photos. I bet the beef tasted amazing with that creamy sliced avocado. Beef + avocado = winning. I love fajitas! These look so yummy! I will be saving this recipe for later. OMG! Just made this for my family tonight. Everyone voted this as a keeper. My college age son even asked me to forward the recipe so he could make it for his housemates!